NIOD Copper Amino Isolate Serum 1.00%. 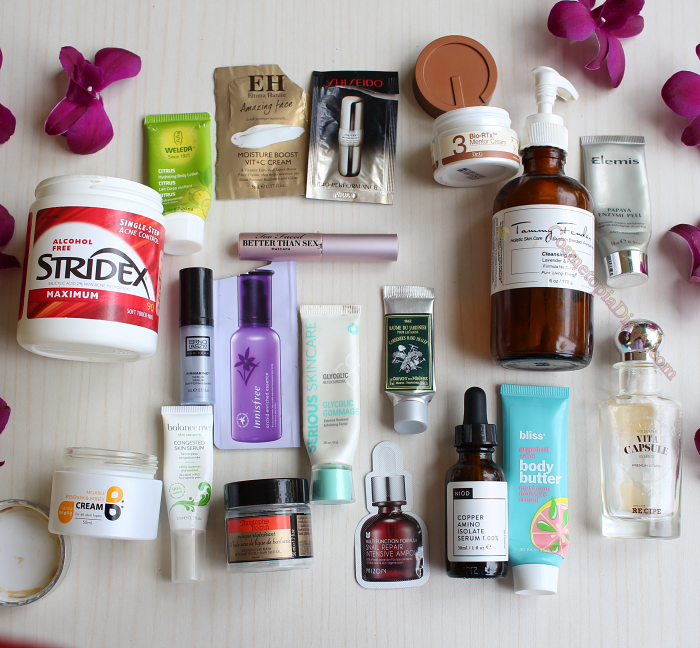 That's the hero of this empties post; it is also the one product I will be repurchasing consistently, for a long time ahead. The name of the product sounds weird. 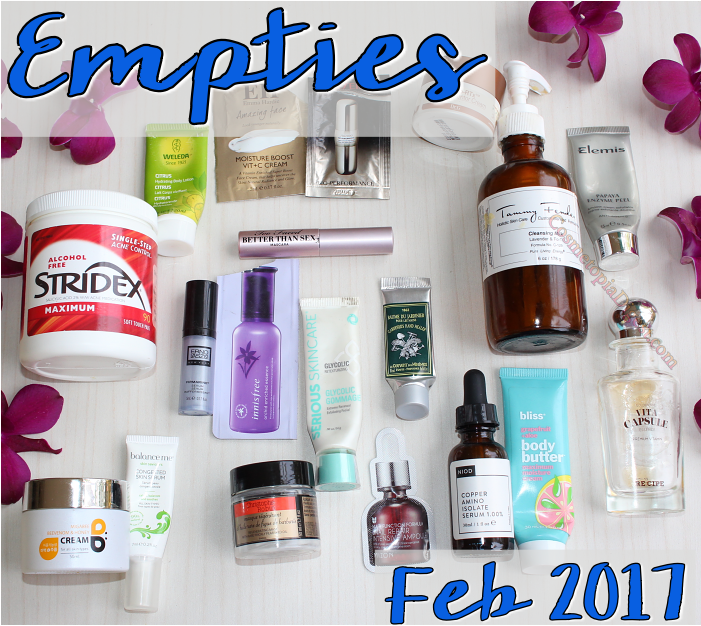 You'll know what I'm on about as you read my empties post. Here are the beauty products I used up in February 2017, and my thoughts on each. Sadly, contains shea butter. Sadly, gave me the one cystic breakout OVER an existing scar, much to the chagrin of my dermatologist, who was going to subcise the area. We discussed the new things I had been using, and he said that shea butter was bad for some people. Repurchase? No. That also puts paid to my Oskia shopping list. Argh. I love their sunscreens and their makeup, but Shiseido's skincare had not really wowed me, until a friend told me it was completely different in South East Asia and Japan. I went to Singapore recently, and found she was right. They have ALL the products, including ones we didn't even know Shiseido had, and we get the not-so-good, where everything is written in English. Repurchase? No. I have to go to the Far East/SE Asia and stock up on the good stuff. A good choice for dry skin. As far as essences go, I haven't come across a product that can beat Mizon or CosRx (yes, the snail essences - see below). Repurchase? Seven bottles in stock. I think - could be eight. I buy these in 90-count jars. I haven't met another BHA product that can control and eliminate acne this well. All the other BHAs take time to produce results; this one works instantly. And I cut each pad in half, so a jar lasts six months. Repurchase? Done. Awaiting arrival. I know, I left it so late. This goes on my face right after acid. Two days' use later, everyone said, oh, you had a facial. And now, everyone says my skin looks healthy - not flawless, I'm treating the scarring, but I WILL get there. This is not a particular treatment or even a serum as such; it is a runny prepping product for the long-term health of the skin. And, believe me, the results are visible. I'll review it soon. Repurchase? On my second bottle. Third one on the way. Will order four to six in April. I have mixed thoughts about this one. On the one hand, it smelled so good and was super-relaxing. It was gentle, did a great job cleaning and did not strip my face. On the other hand, I had massaged it on my face one day when the phone rang, so it stayed on for a few minutes - and then, my face started to burn and I had to cut the call short to rinse it off, only to reveal a red, sore face. Repurchase? No, for the reason stated above. Oh, if not for the fact that I already have four full-sized (stronger) peels in my cabinet, I would buy this for the smell alone! Lovely! A good choice if you have sensitive skin and don't want harsh acids. Repurchase? I graduated to 40% glycolic recently. Stings like mad. That's the good-looking bottle on the extreme right. My Dad saw it on my counter one day and says he wants it "to store hair oil" - don't ask. But this is the runniest product I've ever met! It is bi-phase, but you just cannot apply it unless you decant it into a spray bottle and spritz it on. Lightweight; felt great on the face, silky texture; sunk in beautifully. I layered this beneath Mizon Snail and Peptide Energy Ampoule. Repurchase? Too many serums to use up. Pretty much everyone in the K-beauty world said this was perfect for oily skin. No, it was not. I ended up with a grease-fest. Repurchase? I'd rather rub LARD on my skin. An occlusive layer to finish the skin routine. I used this to seal in all the goodness, above facial oil. Repurchase? There are better occlusives out there. I got this in a beauty box. I used it as a quick pick-me-up face mask before special occasions. Reminds me of GlamGlow Youth Mud. This girl - sorry, I forgot your name. If it was you, give me a shout and I'll credit you and apologise profusely - told me that the reason Balance Me products and I did not get along was that they used a high percentage of essential oils, which were irritating my skin. She's probably right. I want to love their products so much; their hand creams and body products are great. But the skincare breaks me out. Very good stuff. I rate Lancome's Hypnose range a whisker above, though - because I have weird peach fuzz in lieu of lashes. Gosh, this man is a GENIUS. This is my third pot, and I cannot get enough of this luscious hair mask which contains prickly pear oil. It smells so good on my hair until the next wash. It softens the hair like no other. If my hair looks decent in FOTD pictures, it is because I washed it that morning with this mask. Repurchase? I have two more pots left. I had tried the Lemon Sage body butter from Bliss before. This one is even better - the smell is fabulous, the texture is creamier, and you are hydrated all night long. Repurchase? Do you have any idea what my body moisturising product-stash looks like? Fuss-free. Runny. Smells nice and citrusy. I think this is a better choice for the Summer, given the light texture. Repurchase? I have, what, 10 body lotion bottles and five body butter jars in stock? HOW do the French have such fabulous bath and body products? Last year, I went to Brussels and picked up so much French soaps and body lotions that I had to pay EUR180 as excess baggage. This is one of the loveliest hand creams I've used in a while, and I don't even know where to find it. Repurchase? I have no idea where to find it. Boots? Carrefour? What have you used up recently? Tell me in the Disqus comments widget below.